The Galway Races Summer Festival is one of the social and sporting highlights of the year and will get under way on Monday, July 27. The seven day racing bonanza at Ballybrit will play host to more than 150,000 racing fans, 800 horses, 52 action packed races, leading owners, trainers and jockeys, all competing for a record level of prize money in excess of €1.8 million throughout the seven-day festival. To celebrate the 50th year of the longstanding relationship between Guinness and the Galway Races, the Guinness Galway Hurdle purse for Thursday July 30 has been increased to €300,000, making it the richest National Hunt race ever in Ireland. The feature race on Wednesday, the tote.com Galway Plate, has also been boosted from €20,000 to €220,000, following the announcement in June that Tote Ireland has renewed its sponsorship of the Galway Plate Day for a further three years. Prize money for the feature races on both the Monday and the Saturday of the festival have also been increased to €80,000, with each of the seven days now featuring a race with a minimum value of €80,000. The minimum prize money for all festival races is also on the rise and has been increased from a minimum of €10,000 in 2014 to €12,000 in 2015. 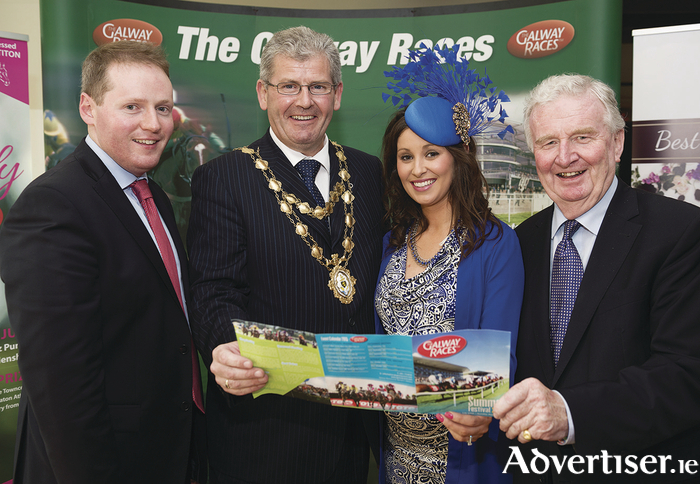 The Galway Races also sees the return of many of its sponsors, including Topaz, Latin Quarter, Caulfield Industrial, Ladbrokes, Easyfix, Colm Quinn BMW, EBF, Trappers, Galway Shopping Centre, At The Races, Martinstown Stud, and the Athlone Town Centre, as well as welcoming new sponsors for 2015, McGettigan’s and JPK Fencing. The Galway hotels are generously sponsoring the opening day of the meeting, including the Radisson Hotel, Galway Bay Hotel, Claregalway Hotel, Clayton Hotel Galway, and the Connacht Hotel which sponsors the feature race of the evening, The Connacht Hotel Qualified Riders Handicap. The Topaz Mile takes centre stage on Tuesday, with Topaz selling tickets in its Galway service stations for the price of €10, a saving of €15 on the usual price of €25. This offer is available to anyone who spends €25 on fuel selected sites in the greater Galway region. Ladies' Day promises to be a spectacular celebration of style, with Kilkenny Group recently unveiled as the Best Dressed Lady sponsor. The fabulous Maura Derrane is this year’s celebrity judge, together with the Irish Independent and Weekend Magazine fashion editor Bairbre Power, Image publications editor-in-chief Melanie Morris, and local catwalk model agency owner Mandy Maher. With prizes on the day for Best Dressed, Best Irish Design and Best Hat, the stakes have never been higher. The winner of the Best Dressed prize will receive a shopping spree at Kilkenny, a five-star luxury break with Bluebook Ireland, a new wardrobe courtesy of Aideen Bodkin, Irish jewellery by Maureen Lynch, a bespoke crystal trophy by Waterford Crystal, €1,000 haircare from Peter Mark, and a cosmetics package worth €1,000 from Lancôme. Chanelle Veterinary is back on board this year to sponsor the Leading Trainer Award, with Rooney’s sponsoring the Leading Jockey Award, and the best turned out prize being sponsored by Paddy Power bookmakers. Introduced in 2013, the Friday Fair Lady competition continues to grow. This year’s event, sponsored by the Athlone Town Centre, will be judged by Marietta Doran and Roz Purcell, with Robbie Henshaw on hand to present the award on July 31. The Ladbrokes Red Day takes centre stage on Saturday August 1, and offers great prizes for the lady with a red element to her outfit. Family Day and Mad Hatters Day brings the festival to a close on Sunday August 2.